Vulcan is volunteering to commit to a target of 15% of total construction subcontract value in inclusive hiring of women and minority business enterprises (WMBE), supporting employment through Priority Hire, and creating career opportunities through apprenticeships. Vulcan recently achieved similar goals at our project in Yesler Terrace through our agreement with Seattle Housing Authority and we are excited to take what we learned there to continue to generate opportunities in the community. 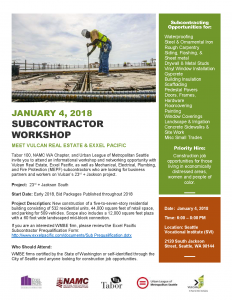 To learn more about these opportunities, please see the flyer attached and we hope to see you at the meeting on January 4! Please feel free to spread the word (and flyer) to your friends, family, and colleagues.